Polar Hose specifically for bulk CO2 transfer. Polar Hose uses a specially formulated elastomer that is compatible with CO2 and low temperatures. 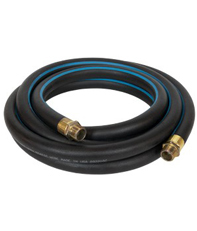 Stainless steel braids and non-corrosive fittings give Polar Hose strength and durability. Polar Hose is lightweight, flexible and strong -- the best choice for CO2 bulk liquid transfer. CO2 Liquid/Vapor 450 psi. 1 in I.D. Polar Hose, Brass, 1" x 1-1/2" Female NPT. CO2 Liquid/Vapor 450 psi. 1.5 in I.D. Polar Hose, Brass, 1" Female NPT. CO2 Liquid/Vapor 450 psi. 1.5 in I.D. Polar Hose, Brass, 1" Female NPT E/E x 2" Female NPT. CO2 Liquid/Vapor 450 psi. 2 in I.D. Polar Hose, Brass, 2" Female NPT E/E. CO2 Liquid/Vapor 450 psi. 2 in I.D. 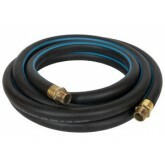 Polar Hose, Brass, 2" CO2 CGA.